Twitter’s move into Internet retail has been widely expected since the company named ex-Ticketmaster CEO Nathan Hubbard its head of commerce last August. Harrison is the owner and Chief Executive Officer at Z interactive. 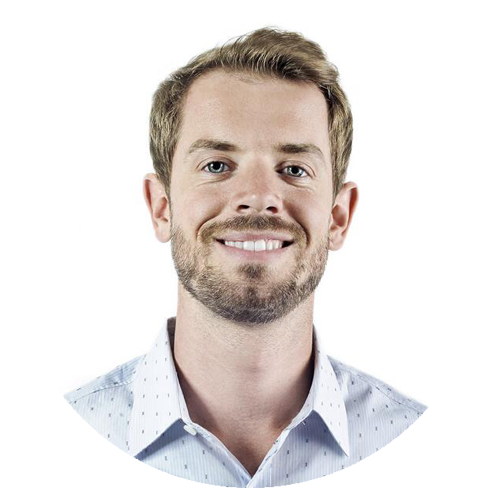 Harrison is a seasoned marketing professional and got his start working in entertainment helping venues leverage forward-thinking internet strategies to pack stadiums and concert halls across the Central Southwestern United States. Follow Harrison Blum on Twitter for great marketing, technology, and craft beer content! If you are like me then you’ll know it’s not only time intensive but a rather daunting task to find great stock images. That’s why it’s imperative to have a go-to resource where you can quickly and easily find great images for free! Not only that but it’s also nice to visit a stock website where the legal terms are clear, easy to understand and easily assessable. That’s why I’ve organized the best of the best sources for finding great free stock images for all your creative needs. 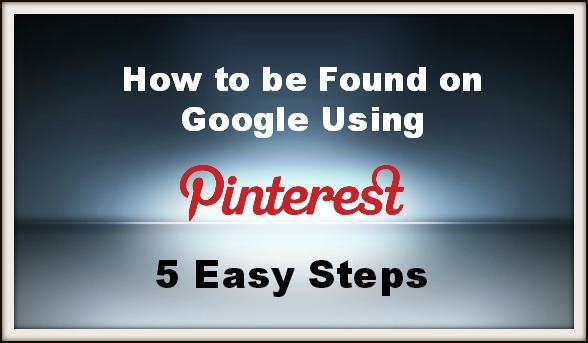 Add your website to your Pinterest profile and go through the verification steps. Even if your website doesn’t strictly pertain to the content on your boards, every back-link counts. Start the simple verification process here. Link up your Pinterest account to your other social media accounts making a link-wheel. Adding your social media links on all of your accounts shows Google you have a growing brand on the web and in turn your website will receive cool points. Disregard any worries about this being considered spam, Google will not penalize anyone for trying to promote their brand and content online. 3) Is your Website Pinnable? Test out your website’s URL in Pinterest to see if you have Pinnable graphics on your website and the user’s selection of images. Many companies don’t have any Pinnable images and lose the opportunity to receive free promotion on Pinterest. Add visually bold graphics to your blog posts by designing your image to attract other Pinterest users. An amazing FREE image editing application to do this with is PicMonkey. Just combine a great stock photo with a few bold words describing the topic of your post and use this as your blog post image. Finally, make sure to add a button for others to quickly Pin your graphics from your blog posts. If your website is on WordPress a great plugin for both of these is the Pinterest Plugin. The Pin will automatically include the exact link of your blogpost and the plugin allow you to manually insert a description to be included in the users Pin. Owner of Megan Leigh SEO & Web Design. Search Engine Optimization expert and strategiest for Dallas, TX and surrounding areas. 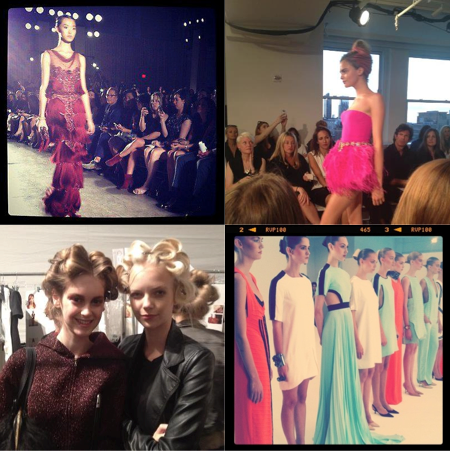 Follow Megan Tegtmeyer on Pinterest HERE! You may have caught wind of Justin Timberlake’s recent single with Jay-Z, “Suit & Tie” quickly climbing to #1 on iTunes just after one day. The song is a perfect segway to introduce the brand new Myspace, now open to the public and ready to turn heads. 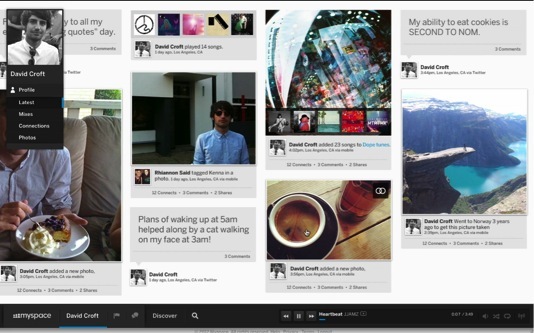 Back in September, Myspace announced a revamped, re-imagined platform for users and artists. According to the CEO of Specific Media, Tim Vanderhook, the new MySpace would be available to everyone by the end of 2012. By his side, the one and only superstar and part owner of Specific Media, Justin Timberlake would see it through. MySpace has been under the radar for the past months in invite-only mode. Years before, the abandoned social network felt like a city demolished by a zombie apocalypse. Users were finding shelter in smarter social networks while the platform slowly ate away at every revenue generating opportunity until nothing was left. MySpace will not be trying to persuade current Facebook and Twitter users to solely use the new MySpace. 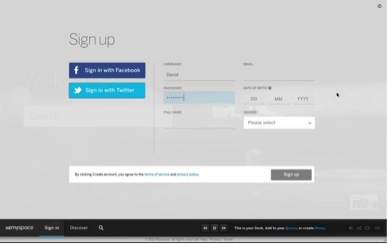 The new MySpace will allow users to sign in to the site using their Facebook and Twitter logins. This will be easier for people to start using MySpace because “it integrates with Facebook and Twitter to be able to pull over your social graph and pull over your identity of who you are” says Tim Vanderhook the CEO of Specific Media in an interview with ABC News. It is one less step and social media site that users have to manage. MySpace will find connections from the user’s current friends and followers. MySpace allows users to post to multiple sites in one step. The new MySpace will be a site that gives filmmakers, photographers, various artists, and musicians a place to express their creative talent on their profiles. Tim Vanderhook expressed to ABC that, “the idea to create something unique and drive a connection with a fan base has a lot of equity”. Artists’ pages will feature a “music catalog”, songs and videos by the artist. These songs can be dragged and dropped to a fan’s playlists. 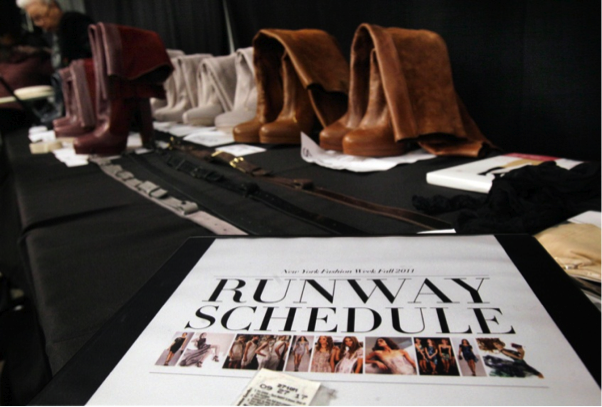 Fans can see upcoming concert events and read more about the artists’ background. The new MySpace will give users the ability to build playlist, add photo albums, and connect with artists in a visually appealing format that will have users in awe. 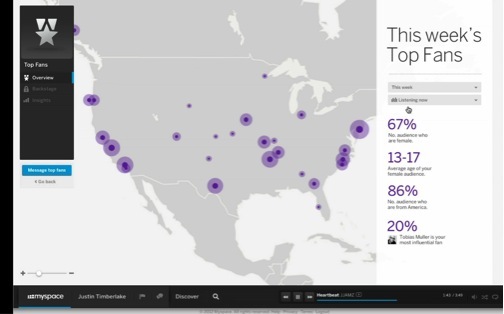 For artists MySpace allows them to gain insights and demographic information about their fans. 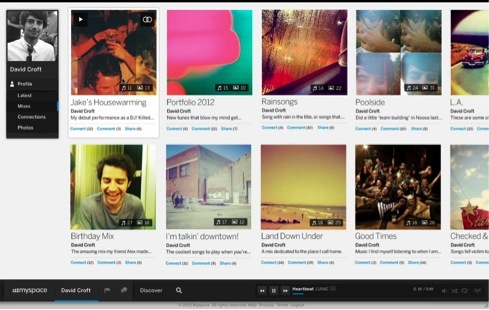 After watching the video for the new MySpace, there is a definite difference between the late Myspace and the new. 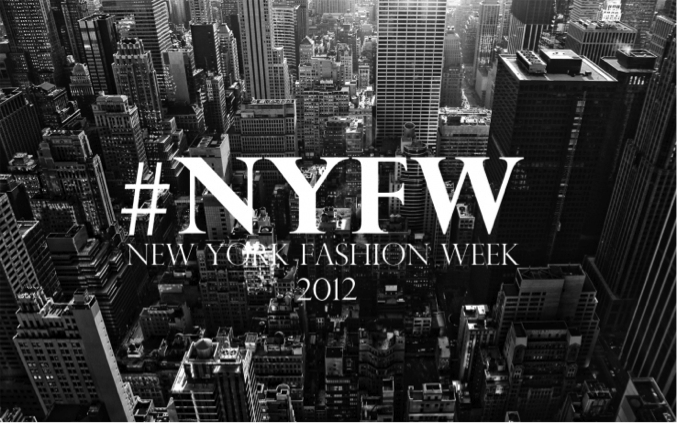 The sleek, minimalistic design is intriguing, clean, and aesthetically pleasing. When asked about the design inspiration Chris Vanderhook, COO of Specific Media, said, “We wanted to build for today and for the future. A lot of the elements from the design is built for widescreen formats for tablets and smartphones”. 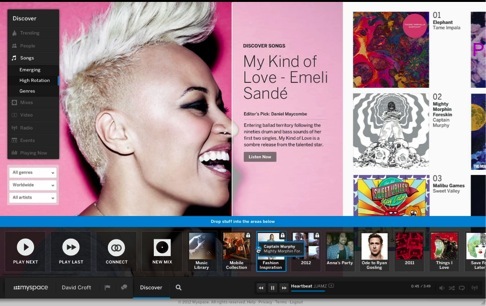 The new MySpace will allow users to explore the site in a visual way, while streaming music from the site. The new MySpace browsing is horizontal, rather than the popular vertical format used by other social media sites. 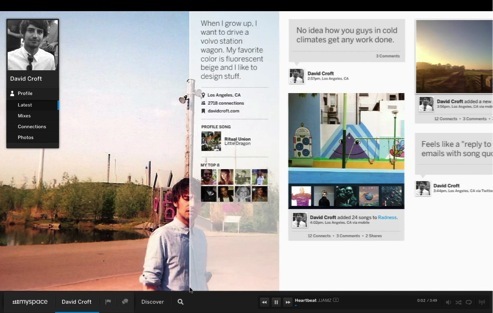 The Stream that the new MySpace features is similar to the format of Pinterest boards. The Stream allows users to see their own recent activity, their friend’s activity, and updates from artists. Mixes and photos that are posted by connections on MySpace can also be seen on the stream. People may post comments on the Stream as long as they say it in 140 characters or less, like Twitter. This adds to the minimal design, it will eliminate long comments and statuses to be posted on the Stream. One feature that has not changed with the new MySpace, is the music. Users can use a drag and drop feature for adding songs to playlists and mixes. People can create a list of songs and collage of photos called mixes. A user’s connections can comment or share it with others. The new MySpace has a navigation bar at the bottom of the page, out of the way from all the photos and videos users can view. 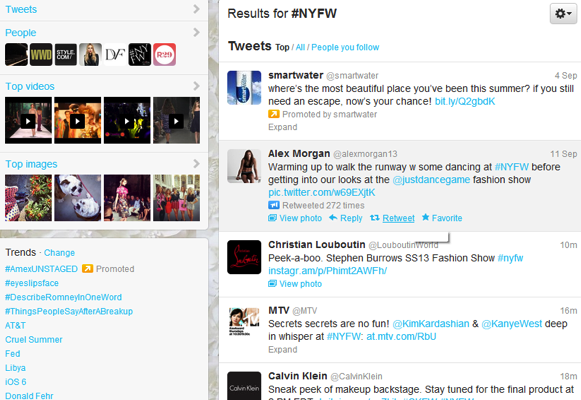 The discover tab allows users to access trending topics, search people, search radio, and find events going on. Will the buzz of the new design and features be enough to drive traffic to the once forgotten site? We highly recommend you spend a little time using the features above and decide for yourself. Your favorite shows are interesting enough to keep your attention right? With all that is infinitely accessible via smart phones, laptops, and tablets, you might want to think again. With the incredible spike in popularity among coming social media and television, it appears we enjoy watching our beloved reality sitcom drama documentaries with others who love them too. Now with the rise of social TV, Youtoo.com has made tv even more social. Youtoo is a Social TV network that allows millions the opportunity to be on TV with a mere click of the mouse. Users can record and upload 15sec videos called “Fame Spots” with smartphones, tablets or personal computers, and be chosen to air during national shows such as The X-files. 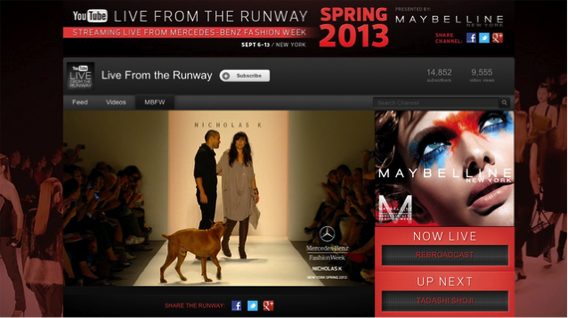 For those new to Social TV, let’s take a look at similar applications. Other social TV networks making a splash include GetGlue, which lets users “Check in” to TV shows and movies they are watching to socialize with friends, get recommendations and earn rewards. Yahoo’s Social TV baby IntoNow gives users a Shazam-ish option to check in via a live broadcast and create an interactive TV experience to discuss and dissect shows in real time. Other sites such as Viggle partner with brands to reward viewers with movie tickets, gift cards to Target, or cups of coffee from Starbucks. It seems only natural that social networking and technology would make a natural transition to better integrate with TV, and provide a proactive way to interact with fans, reach new audiences, and drive viewership. Haven’t heard of shows using Social TV to reach fans? “True Blood”, “Walking Dead”, and “WWE” which announced earlier this year they were teaming up with Tout, are all great examples of shows and brands exploring the benefits of Social TV and scoring big. Youtoo also has the potential to reach a large amount of viewers, because let’s face it, who wouldn’t want to be on TV? It’s the perfect example of Social TV, using the real allure of being on screen, via whatever device they have in their hands. DFW Event Spotlight – Live Music, Food Trucks, Beer, and Dogs? Grab your four-legged furry friends and get ready for the first-annual Barkfest September 15th! From 6-9PM Dallas non-profit Paws in the City will transform Deep Ellum’s 1.2 acre dog park to create a neighborhood party you won’t forget, all to benefit a good cause. Experience live music from local DFW artists, the city’s best food trucks, and local craft beer with a committed goal to raise money and awareness to end overpopulation, abuse, neglect of Dallas area dogs and cats. The event is free to the public and canines of all sizes are invited to join the party as well. If you’ve yet to experience this wonderful park read all about it here. If you don’t have a dog of your own, then your in luck. Barkfest will have plenty of adoptable dogs there looking for their forever home! Pet-friendly vendors will be out in the masses including a pet photographer, a gourmet pet bakery, and Community Pet Outreach who will be offering low cost vaccinations and micro-chipping for only $25 with lifetime registration. ​​Bring some cash* and your friends and know that your partying for a great cause!